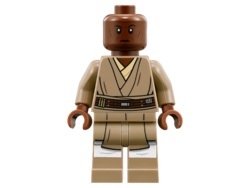 Mace Windu is a minifigure based on a character from the Star Wars movies of the same name. 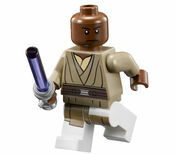 Mace Windu has appeared in four variations throughout sets in LEGO Star Wars, and a fifth variant will be released in 2013. He has also appeared in three of the four LEGO Star Wars Video Games. He first appeared in a set in 2005. Mace Windu appears in the set 7261 Clone Turbo Tank, first as a light-up lightsaber Minifigure, then the figure was later changed to a standard minifigure in the set in 2006, a year after its initial release. The new figure remains similar to the light-up lightsaber appearance, and features a brown head with two black dot eyes, two slanted eyebrows, and a black, slightly slanted mouth. His torso is a dark grey. He wears robes and has a brown belt. He wears a brown cape, has dark gray arms and brown hands. His legs are beige with a gray joint, and he wields a lightsaber with a purple blade. Mace Windu (as he appears in Star Wars: The Clone Wars) features a brown head with black wrinkle lines, two brown eyes and a black mouth. His torso is mostly beige robes with a brown belt and a white inner shirt. His arms are beige and his hands are brown. His legs are beige with a beige joint. A redesign of Windu's Episode III variant was released in 9526 Palpatine's Arrest. He reused Seso's head. Also he reused the Clone Wars torso, although in a darker tan. He was given a redish brown cape. In 2013, a variant of Mace Windu based on his appearance in Star Wars Episode II: Attack of the Clones was be released. Windu has torso and legs that show that he is wearing white pants underneath. He has a Reddish Brown head that shows a frown, and wields a purple lightsaber. Mace Windu in LEGO Star Wars III: The Clone Wars. Mace Windu has appeared in three video games so far. 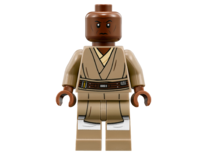 In LEGO Star Wars: The Complete Saga, Windu appears in the level Jedi Battle, and can be unlocked by completing it. He uses his signature purple lightsaber in the game. He is also able to double jump, use the Force, perform mind tricks, and Force-push droids. He appears in his original LEGO outfit. 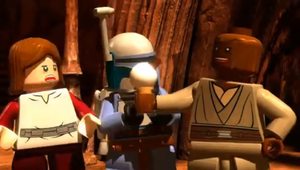 In LEGO Star Wars: The Video Game, Mace appears in two different forms. He uses his lightsaber and can also double jump, use the Force, and block attacks. The third chapter of Star Wars Episode II: Attack of the Clones must be completed to unlock Windu. If Chapter 5 of Star Wars Episode III: Revenge of the Sith is completed, an Episode III version of Windu, depicting his appearance in 7261, can be unlocked. 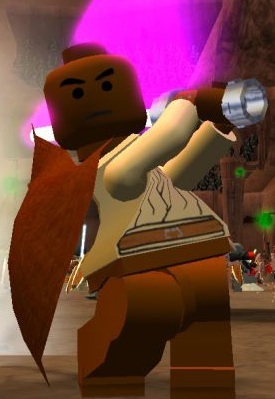 Windu also appeared in LEGO Star Wars III: The Clone Wars. His torso and leg parts appear to be based on his physical design variant from The Clone Wars, however his face has black dot eyes with white pupils instead of the "Clone Wars-style" eyes. Once again, Windu is equipped with his purple-bladed lightsaber. Mace Windu was a Jedi Master from Haruun Kal. He was often recognized as one of the greatest Jedi, second only to Yoda during his time. He was also recognized for being a senior member of the Jedi Council for many years. In Star Wars Episode II: Attack of the Clones, Windu leads an attack force of 212 Jedi knights to rescue Anakin Skywalker, Padmé Naberrie, and Obi-Wan Kenobi from the Geonosians and fights in the ensuing battle. During the Clone Wars, Windu helped overthrow the Separatist occupation of the planet Ryloth as well as assisting Obi-Wan Kenobi in taking a stolen holocron back from Cad Bane. Also, Windu took part in the Battle of Malastare and capturing the Zillo Beast. Later on, Windu was trapped with Anakin on board the Republic Cruiser Endurance, when Boba Fett planted a bomb in Jango Fett's helmet in an attempt to kill Windu in revenge for the death of Jango Fett. However, they were saved through the actions of R2-D2 when the droid alerted the Jedi, allowing Clone Troopers to rescue them. Windu was also famous for creating the Vaapad part of the lightsaber technique known as Form VII: Juyo/Vaapad. He was killed on Coruscant when Anakin Skywalker severed his right hand preventing him from killing Palpatine, who proceeded to electrocute Windu with Force Lightning and threw him out of a window to his death. In the Star Wars films, Mace Windu is played by Samuel L. Jackson, who also plays Nick Fury in the Marvel Cinematic Universe and played Ray Arnold in Jurassic Park. This page was last edited on 30 December 2017, at 08:46.